On Thursday, July 5, 2018, a joint exhibition of artists Navah Joy Uzan and Tamar Sheaffer will open under the title Plan B, curated by Ravit Harari. The exhibition will present sculpture and video installations that dominate the entire exhibition space and intertwine with each other. Navah Joy Uzan’s panoramic videos are projected side by side on the gallery walls, describing surreal urban deserts full of architectural remains, and a collection of ruined antiquities creating an abandoned futuristic post-apocalyptic space. It seems as if Uzan creates a movie set absent of all actors, an invented space that serves as background for an enigmatic story that is not revealed. Although the imaginary spaces do not represent real environments, they are composed of pieces of local reality. They consist of dozens of photographs taken in various locations in Israel, many of them in construction sites and in new neighborhoods that rise around her own neighborhood. In her photographs, Uzan isolates architectural elements, removes signs of life and identif, and creates building blocks from which she assembles digital collages of slow-moving, mesmerizing spaces. Since all the elements were photographed in reality, the work evokes the familiar sense of an actual place, almost ancient and almost futuristic. While Navah Joy Uzan uses technological methods and advanced digital manipulations, Tamar Sheaffer uses intensive and Sisyphean labor. She saws, paints, kneads and pastes, working in paper, wood and concrete, creating a space based on a sensory experience. 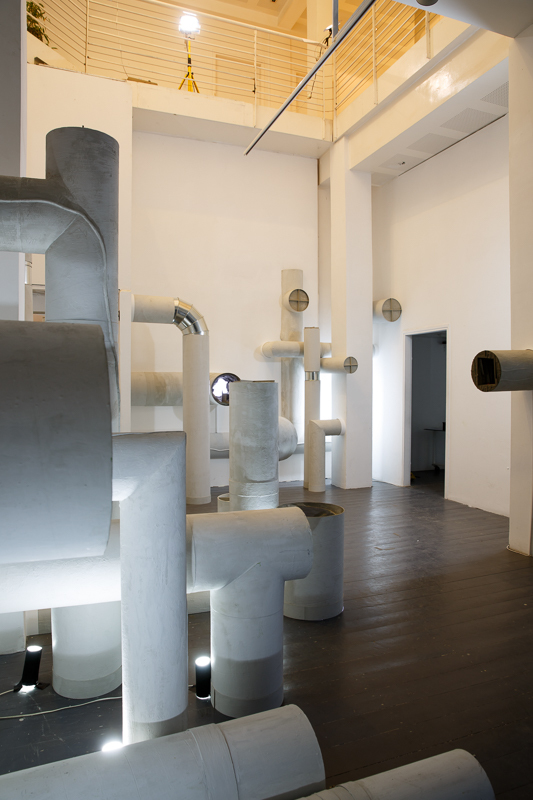 A composition of gray pipes bend and twist along the gallery walls. 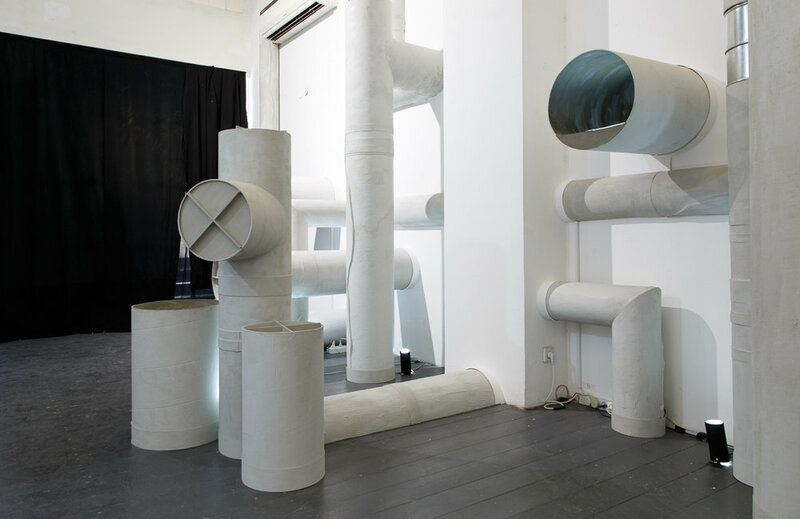 The pipes, covered with concrete, look like water or sewage pipes, but interwoven organic elements add a bodily sensation as well. A glimpse into the illuminated openings reveal an enigmatic inner architecture that invokes an inner world that the eye cannot see, an entire living system that swarms beneath the surface. The title of the exhibition, Plan B, may shed light on the artists' intentions: an inner, hidden, introverted existence may offer an alternative living plan, perhaps the only possible one, given the senses of danger, threat, and anxiety that dwell outside. Tamar Sheaffer - a multidisciplinary artist and a member of the cooperative Benyamin Gallery in Tel Aviv, lives and works in Haifa and Tel Aviv. Graduate of the Beit Berl College of Art and the MFA Program of the University of Haifa (2011). She has held solo exhibitions in the galleries of the Artists House in Tel Aviv, the Janco Dada Museum and the Benyamin Gallery in Tel Aviv, and participated in group exhibitions in galleries and museums in Israel and abroad, including the National Biennale for Drawing and Paper at the Eretz Israel Museum (2017) The art "8 Cube" at the Tel Aviv Museum of Art, and was hosted by Cite Internationale des Arts in Paris in 2016. Navah Joy Uzan – a media artist and a photographer, born in New York, USA. She is a member of the Binyamin Cooperative Gallery in Tel Aviv. She studied art and education at the Beit Berl College of Art and Industrial design at Bezalel Academy of Art and Design, and is a graduate of the Post-Graduate Studies Program at the Beit Berl College (2016). She is a recipient of a photography scholarship from the Spielman Institute of Photography. She has exhibited her works in various group exhibitions, including the Printscreen Festival for Digital Art at the Design Museum, Holon, the Janco-Dada Museum, Ein Hod, the Photo Photography Fair, Tel Aviv - Jaffa, the Galil Gallery in Acre and Hayarkon 19 Gallery in Tel Aviv. This exhibition will be the 6th of 2018, which will consist entirely of exhibitions revolving around the theme 'Vision and Failure'. By dealing with the chosen subject, Alfred Gallery seeks to expand the field of meanings that are embedded between the words: vision, success, failure, intent and improvisation, raise questions about the factors that define these concepts, and break up centers of power.